A WOKING church have revealed revised proposals for a £4 million development on the edge of the town centre, and have again been met with resistance from concerned residents and councillors. Having withdrawn previous controversial plans for an ambitious development in April, the Coign Church and Bouygues Development went back to the drawing board. They said they invited councillors and the public to view the new, reduced proposals to a one-day-only display on Thursday. The previous project comprised two high-rise towers – a 21 and a 17-storey – of 175 homes and a 1,000-seat church ‘auditorium’ in the basement of one. Residents and councillors said no provision had been made for the already congested surrounding roads. There was not nearly enough parking, and no affordable housing or infrastructure measures were in place. Just when a 176-signature petition was gathering pace, it is thought the applicants were warned that such plans in a restricted area would not be recommended by the council. Residents suggested they be consulted so that they could work together on an amicable and practical development that would fit in with the surroundings, to include a bigger church. Their offer wasn’t taken up. 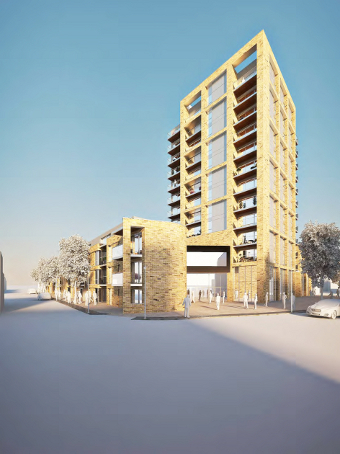 The revised project includes one 12-storey residential block with a church auditorium of 850 seats, plus two ‘three to four-storey’ buildings housing a total of 85 apartments. They said the plans include an underground car park. Although residents totally concur that the area badly needs regenerating, they said the proposals are still ‘ill-conceived’ . Residents said they were given relatively short notice to see the one-day-only exhibition, where a model of the project was on display. Fred Griffin, 71, who has lived in nearby Vale Farm Road with his wife Aileen for 12 years and in Woking for 33, told the News & Mail: “The developers were rumbled that the model was not to scale, which they admitted. “It was misleading because in fact it was half the size it should have been and it was made in Perspex, giving a false impression of a light and airy, unobtrusive construction. Again, the project is ill-conceived; the practicalities have not been addressed.